CBD, or cannabidiol, is one of the most famous compounds found in cannabis. This particular cannabinoid has a range of therapeutic applications. Let's take a closer look at what science has found that CBD does to the human brain. Cannabidiol, often abbreviated as CBD, is probably the most famous chemical compound in the cannabis plant other than THC. Whereas THC is psychoactive and produces an intoxicating high, CBD does not. However, CBD does regulate the effects of THC and other cannabinoids. The dynamic relationship between cannabinoids makes a case for combining them. Despite this, CBD still has a significant impact without the presence of THC. As CBD is not psychoactive, the effects are not as overt as with THC. To understand how cannabinoids have any impact, we must look at how the brain processes them. To say the science of the human brain is complicated is putting it mildly. The scientific community understands more about the most mind-blowing and complicated astrophysics than they do about how the human brain works. There is a growing body of research on how cannabinoids interact with the brain. Breakthroughs were made in the 1960s by a team of Israeli scientists led by Dr. Raphael Mechoulam. They were able to identify the chemical structures of CBD and THC. Since then, the endocannabinoid system has been discovered in the human body—the system these cannabinoids interact with. There is remarkable serendipity in humans (and other animals) evolving a biological system directly responsive to cannabis. The endocannabinoid system has cannabinoid receptors throughout the human body. These are linked to the human nervous system, which itself is linked to the brain. Without getting into very complicated neuroscience, chemicals have different reactions with different kinds of receptors. In the case of CB1 and CB2 receptors, CBD may actually dampen their response. Other receptors will bind well with CBD and trigger a neural connection through synapses in the brain. The impact CBD has on other chemicals in the brain reveals much about its potential therapeutic applications. The 5-HT1A receptor is involved in serotonin neurotransmission. Serotonin regulates mood and this particular receptor may be linked to the mediation of anxiety and depression. CBD is thought to have anxiolytic properties which reduce anxiety. There may even be a compounding effect whereby CBD boosts the body's own naturally-produced cannabinoids, known as endocannabinoids. Non-cannabinoid chemicals are also impacted by CBD. There are signs CBD disrupts opioid receptors. This makes cannabis a promising treatment for opioid addiction by altering the brain's reward mechanism. Dopamine, the chemical by which we feel a sense of reward, also interacts with CBD. Anandamide is another chemical discovered by Dr. Raphael Mechoulam. He named it after the Sanskrit word for bliss as he observed its impact on human joy. CBD however, seems to inhibit anandamide reuptake and breakdown, which increases endocannabinoid levels. CBD is also believed to stimulate the growth of neurons in the hippocampus. Enlarging the hippocampus, memory and anxiety management are improved. With all of these complicated, interacting, chemical relationships going on, why is CBD being seen as an increasingly popular therapeutic supplement? For one thing, if CBD can cause neurogenesis, it could offer a wide range of applications protecting the brain from degeneration. When CBD binds to TRPV1 receptors, it plays a positive role in the regulation of body temperature, inflammation and pain tolerance. CBD's potential for the treatment of chronic pain is a particular area of interest for researchers. So have cases where epilepsy and spasmodic conditions like multiple sclerosis saw improvements after CBD was introduced to the system. So CBD has potential as an anticonvulsant, anti-inflammatory, and of course, an anti-anxiety supplement. The anti-anxiety effects of CBD tested favourably against placebos in a 2011 study. Its soothing impacts are even accompanied by anti-oxidant qualities. CBD has a lot of potential, but there is still so much more to learn. If you are interested in CBD as a supplement, be sure to check out our other info sections on CBD, as well as our CBD product line. 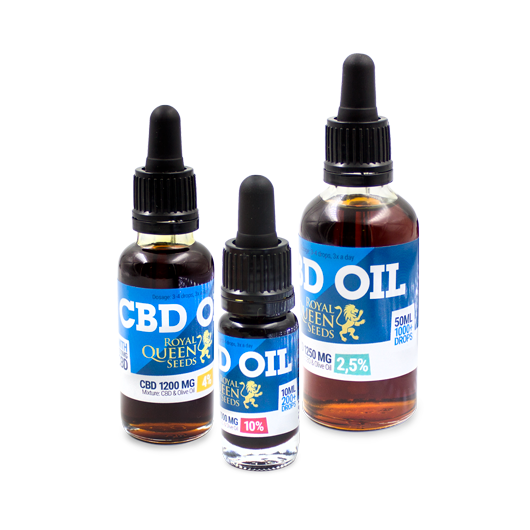 RQS CBD Oil is available in 10ml, 30 and 50ml bottles in 3 different concentration strenghts: 2.5%, 4% and 10%.